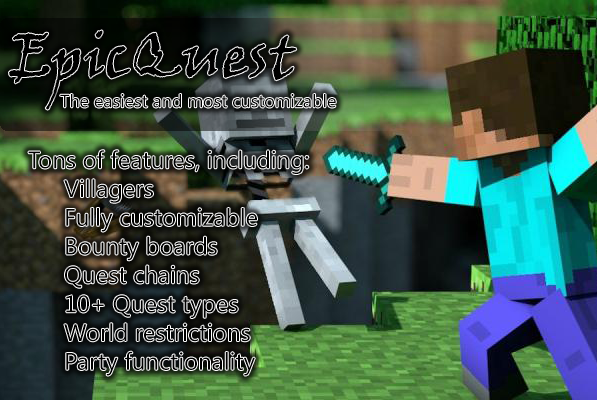 The ultimate, lightweight quest plugin! 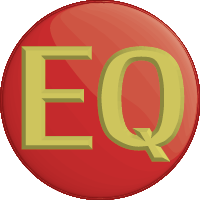 EpicQuest is an easy to use yet highly customizable quest plugin. Immerse your players into Minecraft with a commandless questing experience through villagers, bounty signs and a book to show your progress! Vote for the next feature here! Add either /q or /quest before the commands. This plugin uses plugin metrics since 3.5.3. The plugin sends only basic plugin information for now. Disable this in the "plugins/PluginMetrics/config.yml", set opt-out to true. Check out the full plugin stats here! Consider donating for more frequent updates on the top right of this page! Hello, would be it possible of knowledge if this plugin is going to be put has in the daytime for a continuation(suite) svp? Hey anyone can help me i use epicquest and its created the epicquest's folder but it isn't work what i do?? hey now my server loading the plugin but when i use /q questlist or /q questentity create i get internal error what i do??? Hey, Anyone can help me this olugin didn't work for me what i do??? Hello you can add supported 1.8 version? We want ur plugins pls .. if future updates is coming! pls add Spigot 1.7.10 compatibility! thanks! The plugin breaks if I make a quest that is type 'collect'. Could Mcmmo support be added? Receiveing mcmmo xp for completion of a quest. Where do you make the Quests at? Quests folder or Quests yml? Also once you created the quest how do you set it to the NPC? I followed the instructions but its not working? Documentation could be better cause you have 2 resources for Quests (folder and yml) and its confusing on how to create the Quests. Then it says provide Quest number while the documentation says quest file name? I am so confused! Which do you use and whats the reason for the other? <<reply 2497123="">> Didn't think of that! Thanks! Can't you use the /xp command instead? Can you reward regular XP instead of Heroes EXP? Or would I have to use xp bottles? Reason I ask is because I am using a class system other than Heroes that uses Minecraft XP instead of custom EXP like Heroes does. Hey, thank you for your nice plugin. Are you able to integrate more quest types? How about a quest type "consume"? Any chance that you will be supporting Denizen scripts? I used to use Blackvein's Quest plugin, but he completely stopped developing it. I created a good number of quests that use denizen scripts for cut scenes, advanced dialog, etc. I would love to use this plugin, but fear giving up Denizen. So before, I mentioned that changing the config and reloading didnt work, that I had to edit the config while the server was off. The one thing that is bugged is that changing the save interval to say 3600 seconds or 60 minutes will never stick there. No matter what, the plugin wants to save every 5 minutes. And when it saves, it changes the config back to default. Back to 300. Every single time. Would It be possible for you to implement reverse compatibility for this plugin? I tried updating my server to 1.8.1 but after doing that I found out that most the plugins I use that are both important but abandoned to the server lost functionality, I would be really grateful If you could do this because I have been looking for a quest plugin for a very long time and have not found anything that works on my server version.